She is the master of the current [Old Dame] and for a short time period was also the teacher of Salvatore Doni; she is also the culprit who has offered advice to the newly born Campione, Doni, that later caused a direct and indirect hardship and suffering to countless people as a result of his eccentric behavior. Considered to be the strongest swordsman/woman in Europe, Saint Raffaello is a master of knightly techniques which combine magic and swordsmanship. 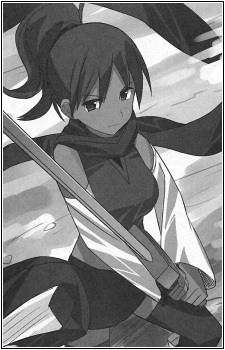 In recognition of her skill, two swords were forged for her instead of one (the standard for most knights). These swords were named Cuore di Leone and Il Maestro.